Meet Christina! She blogs over at Full House, and I guarantee that you'll be hooked after reading one post about her twins or triplets, her shopping excursions, or design loves. She has great taste! I mean, just look at that piano. And those dresses! A few posts back on the original blog, I requested some photos of your collections, and Christina is the first participant. 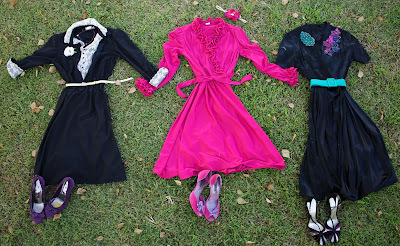 She has a gorgeous collection of vintage dresses. I really want to shop with this lady - she finds the best stuff! So thanks a ton for the photos, Christina - and the rest of you really need to check out Full House. Be prepared to "ooh and ahh" or crack a smile! 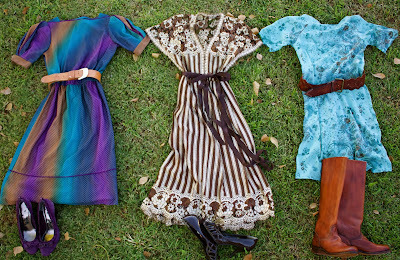 Oh love love love those dresses! 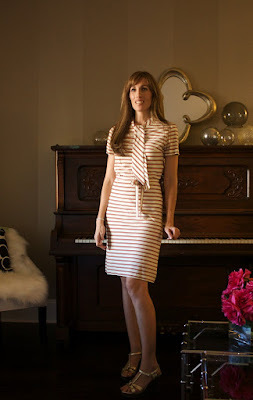 Christina is one of our most visited blogs. So good to see that others enjoy her blog as much as we do. We found your blog from her blog. We will have to come visit your often as well. Thank you for the nice post. Dan and Deanna "Marketing Unscramlbed"
I love all those dresses. I am now on a mission to be just like her. isn't she the most creative person - ever!!!??? i've been a fan of hers' just for a few months since i discovered her. everytime i see she has a new post, i can't wait to see what she has in store. she is aaaamaz-ing! 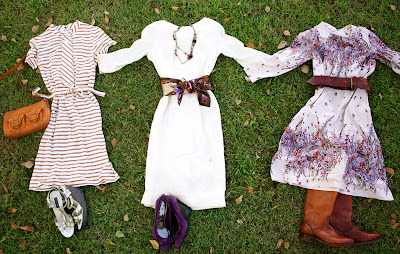 just want to know...who's idea was it to photograph these gorgeous dresses on the grass with fall leaves???? so clever!!! just lovely. I'm so glad you all stopped by for a visit! Christina IS amazing. That was her creative idea to display them on the grass...isn't it great? !